Stellar nurseries are cloudy and dusty places that shine brightly in infrared light. The G305 star-forming complex is no exception. It features a number of bright, intricate gas clouds heated by infant stars in their midst. 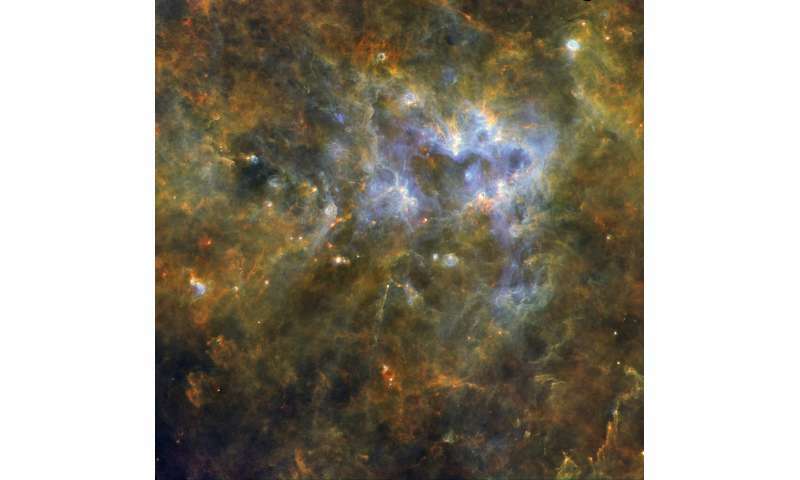 In this spectacular image by ESA's Herschel space observatory, these star-forming hotspots stand out in a blue tone that contrasts with the red-brownish colour of cooler regions. While there are several star-formation sites dotted throughout this scene, the most striking ones surround the dark, heart-shaped area in the top right of the image. Hidden at the centre of the dark region lie the massive star WR48a and its two neighbours, stellar clusters Danks 1 and 2. All three play an important role in triggering the formation of new stars, even if they themselves are relatively young objects no older than a few million years (for comparison, the Sun is around 4.6 billion years old). Strong winds and radiation from WR48a and the high-mass stars in the two clusters have pushed away the gas remnants from the cloud where they originated. The swept-away gas, gathered together at the edge of the heart-shaped bubble, is now forming new stars. Using Herschel, astronomers have identified 16 sites where high-mass stars are forming in this stellar nursery. The region is one of the brightest and most plentiful star-forming complexes in the Milky Way, and an ideal ground to observe and study massive stars at different stages of formation and evolution. The G305 complex is about 12 000 light-years away and gets its name from its location at around 305º longitude in the plane of our Galaxy. In the night sky, it appears near the Coalsack Nebula, a large interstellar cloud of dust visible to the naked eye and located in the constellation of Crux, the Southern Cross. A very prominent dark nebula, Coalsack shows up in the southern skies as a black patch against the bright, starry backdrop of the Milky Way. This image, obtained as part of Hi-GAL – the Herschel infrared Galactic Plane Survey, combines observations at three different wavelengths: 70 microns (blue), 160 microns (green) and 250 microns (red). Launched in 2009, Herschel operated for four years observing at far infrared and submillimetre wavelengths. This spectral range allowed it to observe the glow of dust in gas clouds where stars are born to investigate this process and observe their early evolution.